Another reason to party hardy when you turn 28: you are still alive. 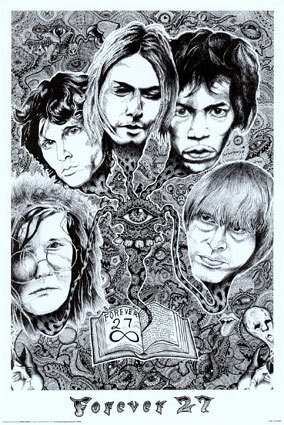 The 27 Club refers to the many celebrities (especially in music) who died at age 27. I had no idea there were so many! The top musicians include Jimi Hendrix, Janis Joplin, Jim Morrison, Brian Jones, Kurt Cobain, and Robert Johnson. Yeah, I didn’t miss their deaths, but the age thing is a bit weird. Wikipedia also lists less prominent members and near misses. There’s even a tribute MySpace page. said gerald on October 12, 2007 2:08 PM. said jasper on October 21, 2007 1:51 AM. said lucifer christ on February 2, 2009 2:40 PM.